Client engagement technology provider rplan revealed a plan of its own this week. The U.K.-based company has been acquired by InvestCloud for $20 million. rplan offers API-based technology to help investment firms, especially heavily regulated companies in international markets, support their clients. The company counts four of the top eight institutional asset managers in the U.K. as clients and will now be available to InvestCloud’s client base of more than 700 firms, including some of the largest financial institutions in North America. John Wise, chairman and CEO of InvestCloud, said that institutional asset management is an “important and growing segment for InvestCloud.” Wise also noted he will leverage rplan to grow InvestCloud’s direct-to-consumer and digital product channels. “They truly complement the InvestCloud Digital Platform and will bolster our successes in this space,” Wise added. rplan Director Andy Creak said that combining InvestCloud’s financial resources with the rplan solution and industry knowledge will help the company “dominate” the direct-to-consumer market across the globe. rplan was founded in 2011. 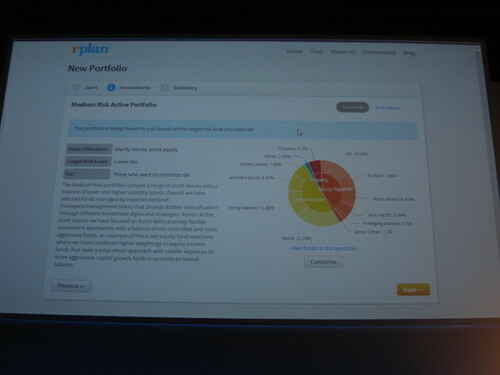 At FinovateEurope 2013, Creak, along with CPO Nick Curry, demoed the rplan portfolio builder, which helps users create an investment portfolio based on key criteria such as goals and risk. Since then, the company has launched an online course providing education on the fundamentals of investing and introduced a simple, transparent pricing structure. rplan announces new “simple, transparent” charging structure. Crypt.la lists its top 10 most interesting Ripple protocol services. Tech Cocktail Austin interviews Dwolla COO, Charise Flynn. SmartAsset launches Retirement Planning Tool, Announces 40% Month-Over-Month Growth. The Tally focuses on India-based Heckyl Technologies. Zopa embraces ThoughtWorks technology to improve data analysis capability. Fenergo releases enhanced compliance and customer onboarding support solution for FIs. Hedge Fund Alert highlights QuantConnect. FIS announces seven-year agreement with FirstBank Puerto Rico for outsourcing services. The Valley Girl Show interviews Locaid CEO, Rip Gerber. Creative Huddle takes a look at TransferWise as a disruptive force in banking. BillGuard launches early, limited MVP testing version of iPhone app. Expensify bolsters SalesForce integration by supporting FinancialForce. American Banker reports Backbase launches Portal 5.4, enhancing digital marketing to include better targeting & more. Cortera launches Cortera Lookalikes to seek out new customers that look and act like a company’s existing customer base. rPlan launches “rplan University”, an online course to provide crucial education on investing. ID Analytics launches ID Network Attributes, targeted consumer behavior insights that provide visibility into identity or transaction risk. Lend Academy reports LendingClub loans being snatched up quickly (within hours). PaySimple partners with CheckAlt to provide suite of payments and receivables tools to SMBs. Taulia to guarantee $1 million saved within first year. Validata to provide test case content for Temenos T24 German Banking Suite. • What have I got? • How well am I doing? It shows users how much they have invested and where, but also tells them how they are doing based on risk, cost, performance, and goals. Finally, it offers in-depth analysis based on asset allocation and fund analysis, alerting users to how they can improve their portfolios. Portfolio builder helps users create an investment portfolio based on key criteria such as goals and risk. It allows users to narrow down from 2,400 available investments to those that are applicable to them, giving them feedback on their investment decisions as they go in areas such as asset allocation and fund selection. Here’s part 2 of the sneak peek of the companies that will demo at FinovateEurope on February 12 and 13 in London. Each company provided a short summary of the innovation they will debut on stage. We published 27 last week and we will complete the preview next week. Don’t miss the opportunity to experience the hottest innovations in financial technology. 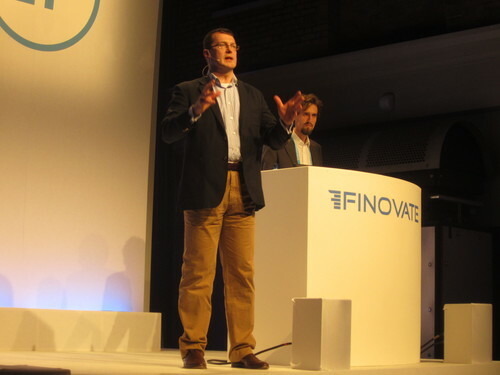 Get your FinovateEurope ticket here. Digital Marketing professionals can use Backbase purely for digital marketing purposes: e.g. collecting user behavior and running campaigns in specific sections of existing websites and platforms, then assigning certain areas where Backbase collects data and shows campaigns. With Backbase you can now start small. Just embed in your existing site and expand from there, creating a full cross-device user experience platform. Heckyl FIND (Financial In News & Data) is real time news and data analytics platform for retail traders and brokerages. FIND is integrated with trading terminals to provide high quality information, visuals, heat maps of sentiment and market data to help traders find trading opportunities in this fast moving market. FIND helps you explore new ideas and keep pulse on current business events/issues. Whether you are a short term trader, investor, or fund manager – whether you prefer equities, futures and options, forex or commodities – you will find a wealth of information that matters to you streaming at your fingertips. Holvi is the long tail of retail banking. It changes the whole concept of the bank account from a passive utility to an active enabler of any activity. Out-of-the-box Holvi comes with built-in payment acceptance, tools for financial understanding and the ability to share it with a group. We bring in building blocks from our banking and payments partners that our customers can add to their Holvi accounts. Holvi is used by small businesses, non-profit organisations, projects and individuals. Holvi is regulated by the FIN-FSA and is located in Finland. Holvi is launching Europe-wide in 2013. Point solutions for payments? Why limit yourself? Proven at scale in Africa, Tereon is a complete payments ecosystem and toolkit designed to support rapid innovation. With Tereon, you can implement any number of innovative products and payment services, be they point solutions or new networks. You can support any business logic, and you can use existing core systems and settlement processes to provide secure, inter-operable, account-to-account, payments that meet stringent regulatory standards. We will demonstrate a four-party deployment that supports payments from phone to phone, phone to card terminal, card to terminal and on-line in multiple currencies. Metaforic has a product that protects mobile applications from unauthorized changes and subversion of the existing code. In effect, by using our solution, the financial institution has control over what the application does if it is compromised. It can quit, display a message, send a silent security alert to bank servers or any other behavior the developer cares to define. For financial institutions that have a lot of mobile developments underway, Metaforic technology can be integrated with existing developments at the end of the software development lifecycle. This technology is an automatic process not requiring significant developer time or security expertise. Pockets United occupies a hot space: carriers see their business threatened by all-encompasing data flats, while traditional banks and credit card companies see payment shifting to mobile devices – whose users are owned by the carriers, ultimately leaving both seeking for differentiators. BAM! ‘Social’ is the next big thing in mobile payments, yet it is not easy to implement for existing PSPs or banks. A category killer in this field must be social by design. Think of us as Paypal, just with a lot more pal – and get excited about a cutting-edge user experience that is fun to use day after day! Because, after all, dividing expenses should lower the burden for all, not cause additional effort for some. Investing can be time-consuming. rplan has created a simple, easy-to-use tool to create your own personal investment portfolio from over 2,400 available investments to find the ones best suited to you. rplan is for customers who want choice, but who don’t want to become finance specialists just to manage their investments – because there are better things to do in life than researching mutual funds. SumUp’s vision is to change commerce on a global scale starting with a real and existing payments problem. Today, millions of small businesses are missing out on customers because they cannot accept card payments due to high fees and long contract durations. SumUp offers the easiest way for small businesses to accept card payments. Using only a portable card reader and an app for iOS and Android, merchants can accept card payments on their mobile device, with a transparent fee of only 2.75% per transaction. SumUp will demo a new cashless point-of-sale solution that will radically simplify the way people pay in every day life.